Oscar Cruz boxes out a defender during Indian River’s 4-2 win over Seaford on Thursday, Oct. 5. 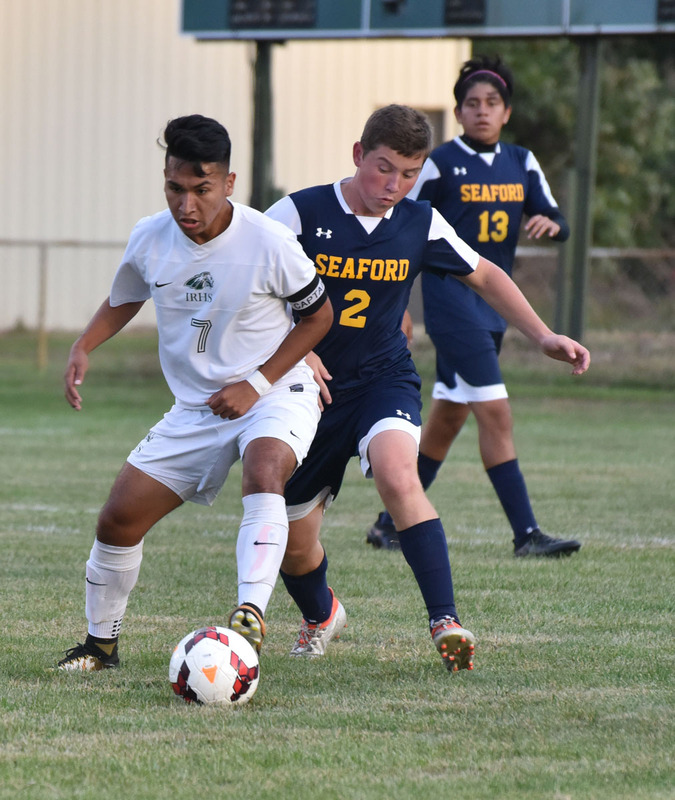 Indian River High School’s boys’ soccer team improved their conference season record to 5-2 with a dominant 4-2 win over Seaford High School last Thursday, Oct. 5. IR was first on the scoreboard, as senior Oscar Cruz Osorio hit the game’s first goal at 26:21, with an assist from junior Luke Morgan. “We knew they’d be a tough opponent,” Cruz Osorio said. “We had to work extra hard today, especially since it was a conference game. We put more players in the middle. At first, we started with a 4-3-3 — we wanted to see how it was. Seaford senior midfielder Andy Elorge tied it at 1-1 with a penalty kick. With less than 2 minutes in the first half, the Indians’ Jared Cordoba got a head shot into the goal to give IR a 2-1 lead at halftime. Cruz started the Indians’ second-half scoring with a penalty kick. IR senior Wilberth Gonzalez Gomez sealed the win several minutes later. “I played pretty hard today, but we could only get this win with our teammates. They helped us out a lot — playing the ball, playing quick, finding our feet,” said Gomez. IR out-shot Seaford 24 to 6, and Indians junior goalkeeper Zachary Neal was credited with six saves, while Seaford goalkeeper Moshaun Bennfield made 20 saves. IR also had five corner shots. IR soccer players had a busy week, with three more home games this week. On Tuesday, Oct. 10, they hosted Polytech, pulling out a 2-1 win to take the Panthers to 2-6 on the season. On Thursday, Oct. 12, at 6 p.m., (after Coastal Point press time), they were set to host the 5-4 Milford Buccaneers, who are coming in on a three-win streak. On Friday, Oct. 13, at 3:30 p.m., they will host 3-2 Holly Grove Christian School from Westover, Md.